A family patriarch dies. Let the aimless infighting begin. An unhappy family being unhappy in the Oklahoma way. Dearly Departed’s Bud Turpin, patriarch of a blue-collar Oklahoma family, has about as much stage time as Godot. He collapses face-first onto the kitchen table in the very first scene. Posthumously described by his wife Raynelle (Jana Siebrecht) as “mean and surly,” we never have the chance to witness him doing more than lurking behind a newspaper over breakfast. And like Godot, Turpin’s absence is the dramatic engine of this play. Before his body is cold, relatives start to converge on the homestead (read: trailer) to pay their respects, and the absurd merrygo-round that typifies family gatherings is set into furious motion. First to set off for the Turpin residence are ostentatiously pious, Bible-quoting Marguerite (Gail Cory-Betz) and her bandana’ed, wisecracking son Royce (Jason Goetz) — though not before Royce is roused from his hungover slumber next to last night’s fling. On some other highway, we find Bud’s youngest son, ne’er-do-well Junior (Bryan D. Durbin), and his loudmouth wife Suzanne (Nadine Carr) in transit, along with their three (unseen) rugrats. There’s heated talk of a failed business venture and the explosive discovery of a mysterious earring. Meanwhile, eldest Turpin son Ray-Bud (Willy Dowling) and his wife Lucille (Sarah Miller) are busy making funeral arrangements. Cost isn’t an issue for anyone except Ray-Bud, who’s footing the bill and sneaking gulps from a hip flask to quell his irritation. Two minor characters soon enter the fray, harbingers of several more to come. One is a fireand-brimstone preacher (Mark Pleasant); the other is Bud and Raynelle’s young daughter, a mute glutton with the ironic name of Delightful (Nikki Nicholson). Delightful’s only role is to wander lethargically around the stage and eat, one of many comedies tangential to the primary one. These tangents overwhelm Act Two, when we encounter a parade of anonymous characters from the surreal world of daytime TV talk shows. Whatever semblance of a plot might have existed is now given over to incidental sketches: overweight Nadine (Donna Holland) with a slew of illegitimate children named after B-list celebrities, and Norval (Pleasant again), who hobbles in on a walker and tries to bribe the audience into rescuing him from his overbearing wife Veda (Vicky Weaver). There are token attempts to find meaning in Bud’s death and reconciliation among the bickering family members, but substance, like coherence, is an afterthought to the yuks. Case in point: Delightful might have provided some surprisingly tidy philosophical nugget to close out the play. Instead, her one-word eulogy to her father is a cheery, “Bye!” Which captures the frivolity of Dearly Departed nicely. 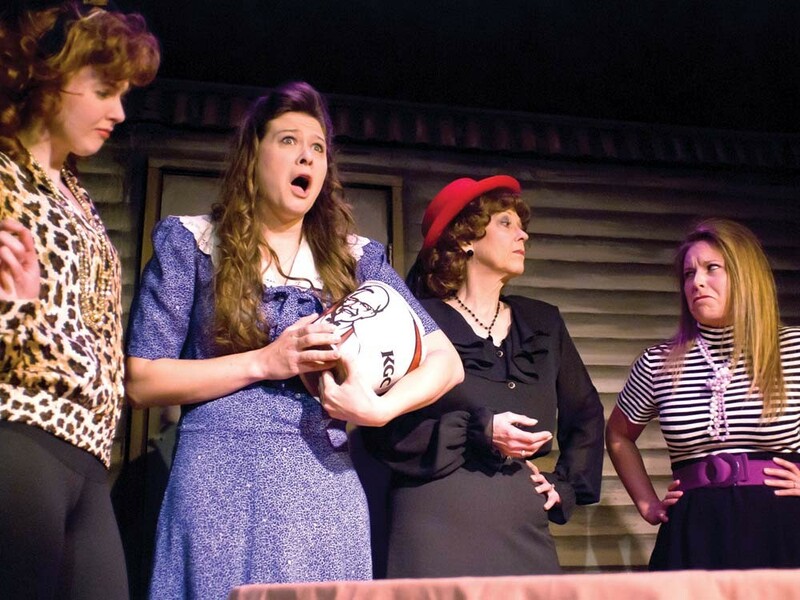 The Lake City Playhouse production pulled off this farrago of farce, slapstick, and cornball gags with charming ease. Southern accents slipped occasionally, and there was a tendency to ham things up when the audience was ripe for another round of guffaws. But the biggest obstacle was a play that lazily relies on trailer park stereotypes, flimsy gender-based characterization, and iffy humor. Whatever the faults of the script, the cast of Dearly Departed played for laughs, and they got them in spades.